The Persona series is a bit of an oddity; a spin-off so successful it became its own brand and produced a bevy of spin-offs of its own. Between crossover fighting games and dungeon-crawling RPGs, perhaps the most odd are the rhythm games featuring the game’s distinctive soundtracks. It’s not hard to see the appeal of it, Persona’s music has always been a strong series identifier and plays a big part in the games’ staying power. 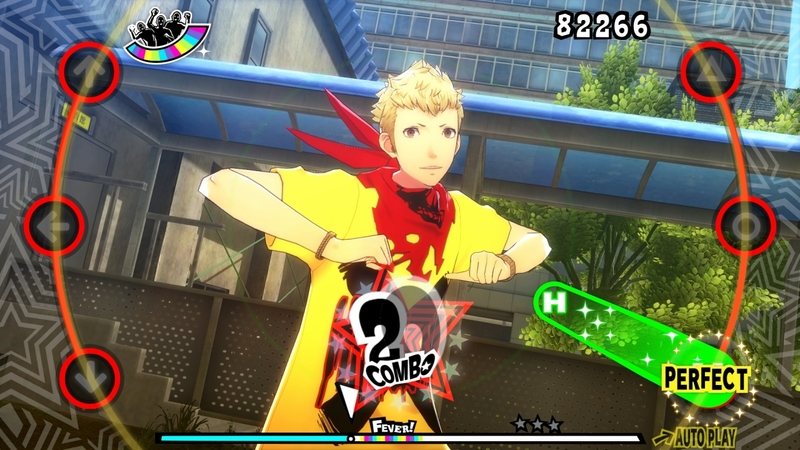 So it’s no surprise Persona 5 would receive the treatment as well with Persona 5: Dancing in Starlight. While its release rounds out the trio of games that have more focus on the moving and grooving than on good old turn-based combat, all the choreography in the world can’t make the game a satisfying product. Dancing in Starlight begins with the cast of Persona 5 waking up in the Velvet Room. After just enough time for the supporting members to voice their confusion, Velvet Room attendants Caroline and Justine present themselves, proclaiming that all of them had been brought there to participate in a dancing competition against their sister, the attendant in absentia Elizabeth from Persona 3. The winner will receive a special treasure while the loser will be dealt disproportionate amount of punishment. Not that any of this matters too much, since the pair admit that regardless of the outcome everyone will wake up the next day and remember nothing about the night. The gang decides “When in Rome…” is the sensible option and agree to dance the night away, practicing for what will no doubt be an exciting conclusion. It’s hard to hold this thin premise against the game since it is nothing but an excuse to have everyone dance together, but those looking for interesting plotting can look elsewhere, there’s nothing here but what ifs and truncated summaries of characters arcs from Persona 5. An eighty-nine hit combo likely means the person playing this hasn’t been watching these two dance at all. The meat of the game lies with its soundtrack and how exactly the player plays along. Gameplay takes place with one of the characters centered inside a ring. Notes appear from the middle of the ring, flying outward toward nodes located on the ring itself. As the notes pass through the nodes, players must hit the corresponding buttons — Up, Left, and Down on the D-Pad on the left; Triangle, Circle, and X on the right — at the right times. Players are awarded points for the four different levels of accuracy: Perfect, Great, Good, and Miss. Hitting successive notes at Great or Perfect quality counts toward a combo that is a necessity for scoring higher points on the songs. There are also different variations of notes, from sustained notes that must be held to double-notes that must be hit in quick succession to scratches, which require a flick of an analog stick or a push of a shoulder button. Scratches are optional notes that don’t count against the combo if missed but add to the Fever Meter if hit. If completely filled by certain points in the game, Fever Time will activate. This is when a partner hops in on the dance and, more importantly, during Fever Time “Good” hits won’t break a combo. All this coming together is technically a rhythm game, but it isn’t a standout one. At higher difficulty levels, the speed of the songs does feel as though fingers are dancing across the controller, putting the body in sync with the music. However, not infrequently do the notes tend to match more with the beat of the song than the actual melody, leading to some confusing note charts that feel as though they don’t entirely flow together. While the visual setup for the game works, the area where the character model dances takes up the entire background of the in-game screen where it will by necessity be ignored as players try and keep track of the notes moving by. Not to say that something visual shouldn’t be put there — it is a dancing game after all — but all the hard work that went into modeling the characters and motion-capturing the choreographed dances feels wasted when the player will be too consumed by the game to notice them. The game does allow for the dances to be viewed separately from the game, a considerate inclusion that doesn’t help during gameplay. The basic, yet functional, presentation is not helped by a lacking soundtrack selection. 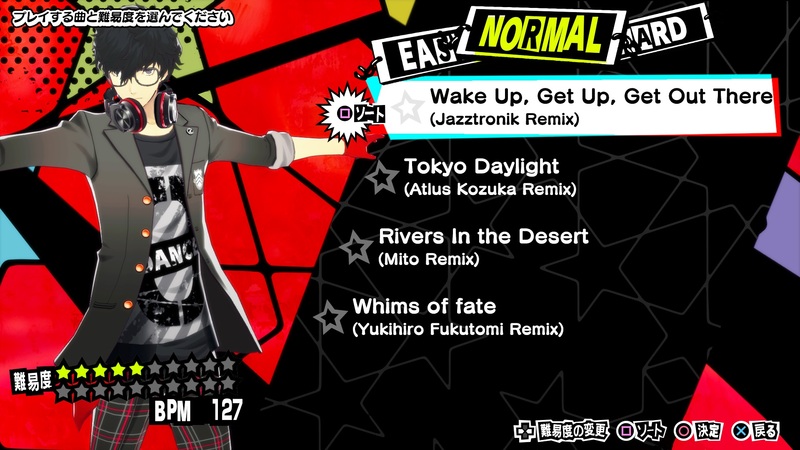 Quality isn’t the problem, the music in Persona 5 is excellent, but for Dancing in Starlight the game Atlus figured that twenty-five songs would be enough. To top it off, like its predecessor, many of these songs are remixes of songs already in the game. It makes sense to remix some of the songs to better dancing music or if the song was one of the more popular ones, but given the brevity of the soundtrack and the frequency at which some songs show up — a handful of songs have two versions, “Rivers in the Desert” and “Last Surprise” have three — the track list becomes very repetitive. Most of the songs themselves are quite good, but one can only play “Life Will Change” so many times before wishing the game had more to offer. Hey, look. It’s almost one-fifth of the song list. Perhaps the most frustrating aspect is that the solution to the problem was set up in the story. Justine and Caroline want to challenge Elizabeth to a dance off between the Persona 5 crew and the Persona 3 crew. Got it. That’s a premise that carries a lot of potential, between adding in another game’s worth of music to the slim song offerings and having the casts of each game get an opportunity to interact with one another. Instead, what’s left is a series of dialogue scenes between two or three characters that have little value outside of seeing them talk to each other some more. The Persona games have likeable casts so this isn’t an issue outright, but the characters have no room to develop and the very premise means they won’t remember anything anyways. For how underwhelming Persona 4: Dancing All Night’s story mode was, at least it bothered to construct a narrative, add some new characters, and put all those characters in new situations. Here, the characters stand around waiting for the player to meet arbitrary markers (hit ten thousand Perfect notes, play thirty songs on any difficulty, unlock seven challenge modifiers, etc.) to unlock a conversation about how dancing makes them feel. These scenes don’t feel additive and the characters don’t exhibit any growth they didn’t show in Persona 5 proper. There are a few wrinkles added into the gameplay, some more meaningful than others. After reaching a certain point in each character’s Social Link, you will have the opportunity to explore each of their rooms. Hidden in each of the rooms is a card that, when found, unlocks new costume options for the characters. This actually does help to reinforce the characters somewhat, but it doesn’t really reveal anything playing Persona 5 wouldn’t have. More interestingly are the song modifiers, which come in Support and Challenge varieties. Supports reduce the player’s overall score on a song but offer beneficial traits while playing. Conversely, Challenges offer a wider range of options to make the song more difficult but increase the score at the end. Given any lasting appeal for the game is vying for high scores, Challenges are the factor to add the most longevity to the game. More bandits should try for the bright yellow t-shirt and red bandana look. Visually, the game looks pretty good, especially for a Vita title. The character models, now featured far more prominently, feel far more detailed than their Persona 5 counterparts. The options to customize a character’s look have also been expanded, offering a larger amount of accessories. Different costumes also make a reappearance, though they still don’t remain equal opportunity. Sure, the men have swimsuits and cross-dressing options, but the women all get far more provocative outfits. Perhaps most disconcerting is one song where all four women from the main cast — with the reminder that they are all between the ages of fifteen and eighteen — dance together in burlesque outfits. Persona has always toed the line with what costumes are available, but this song in particular does not offer the ability to change their outfits and literally puts them center stage. It’s hard to recommend this game, even enjoying as much of it as I did. 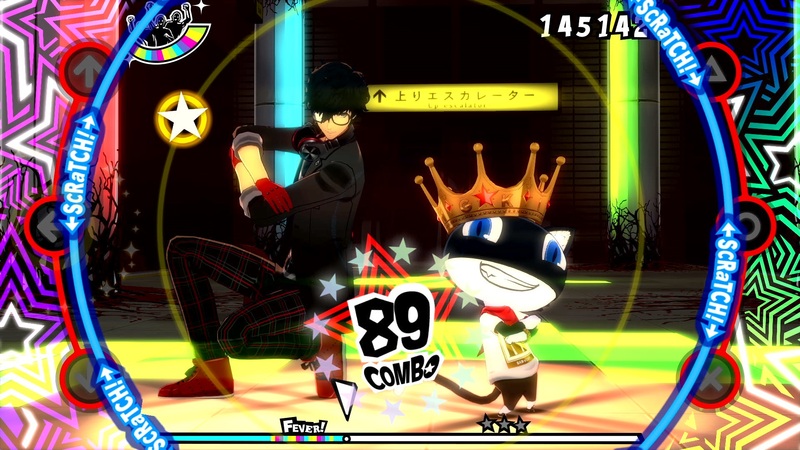 Persona 5: Dancing in Starlight gets right what it needs to get right: The music is still great to hear and the variants, while all of differing quality, still offer some variety. But everything else about the game is bare. As a rhythm game it’s perfunctory but nothing attention-grabbing. As an expansion to the Persona 5 universe it lacks any sort of meaningful events or character development. As an excuse for fanservice it’s under-executed, blowing a potentially fun setup in the name of two separate copies of the game. Die-hard Persona fans, especially those who appreciate the music, will likely find something to hold their interest. However, the strength of the game relies on familiarity with the source material and Dancing in Starlight can’t really hold muster on its own.